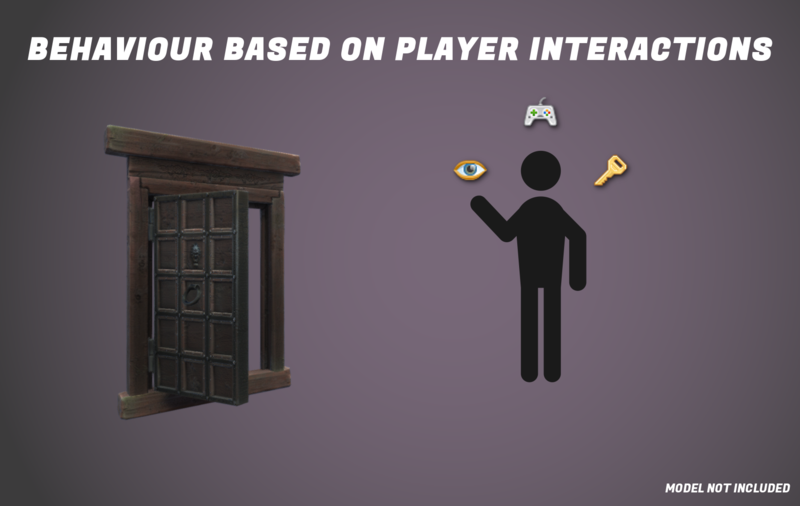 Doors+ is the ultimate system to manage each and every one of the doors and windows in your game! It's intuitive, works 'out-of-the-box' and is highly flexible. There is no coding required, minimal set-up and the tool is feature-rich. Why would I need this asset? If you are creating a game that has doors or windows and you'd like to have 1 system that manages all of them without headaches, this system is for you. You can have custom settings for every single door in your game and you can make them behave however you like. You can make them behave based on tags, names, scripts, raycasts, trigger zones, player input and many more! The tool has been designed to be as non-invasive and easy-to-use as possible. Unsure if you should buy this? You can always try out the free version or contact me at alexanderameye@gmail.com if you have any questions. Need more information? 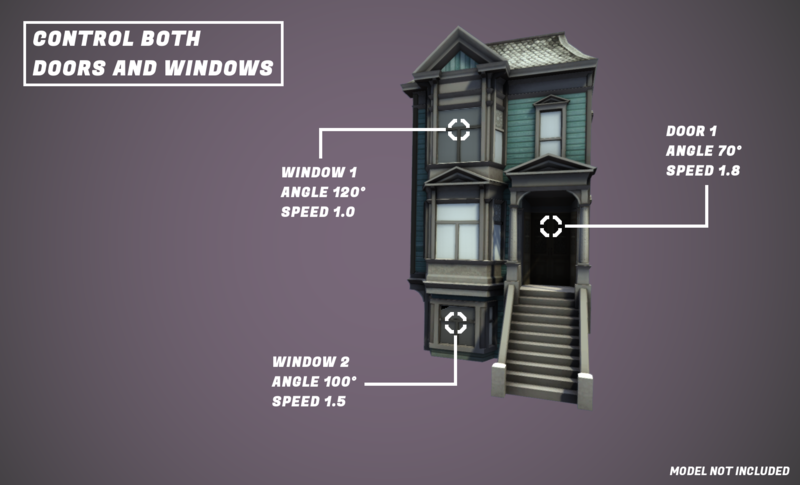 Check out the asset page and the documentation! This asset will receive several updates in 2019 and 2020. I have lots of plans for new features and currently I'm aiming for 2 medium to big updates every year. Right now the focus is on making the asset less invasive and better structured, as well as developing new features. I have a lot of passion for this asset and I'm very driven to make this asset the best it can be. You can expect quick support from me and I will make sure that if you encounter any issues, we can fix them together! Archanor, Magiichan, JohnLabern and 7 others like this. When developing the asset, I focus on creating a tool that meets these 4 criteria. I really try to make the asset not get in your way too much. Personally I really don't like it when an asset changes a lot in your project and messes up the structure of your project. This is an ongoing effort and with each update the asset is getting more organized and less invasive. Archanor and Bartolomeus755 like this. But can you make the door turn into a monster and attack the player? sinstone, frankslater, TeagansDad and 3 others like this. Here a picture of the prototype, might make him a bit less scary though, this is some real nightmare-material. StaticWave, DevMember, theANMATOR2b and 2 others like this. Do you handle revolving doors? For example any of these type of doors. It seems like I have still a lot of more work to do, and that's because, well, it's true. I made the decision though to not include everything in the initial release and I think that that's the right decision. The initial version will be priced around $10-15 and the definite version (that has all the features above implemented) will cost around $20-30. It seems like I have still a lot of more work to do, and that's because, well, it's true. I made the decision though to not include everything in the initial release and I think that that's the right decision. The initial version will be priced around $10 and the definite version (that has all the features above implemented) will cost around $20-30. Yes it does. You definitely need a cutoff on your initial release. Will you also include vehicle doors too? That is a really good idea! Vehicle doors might be a bit tricky though because they are very often irregular shapes so it would be near impossible to create an algorithm to automatically locate a correct hinge position. A solution would be an approximation and then a built-in pivot editor so the user can manually fine-tune the position of the hinge. I'll put it up on the wish list though, thanks! EDIT: Vehicle doors will be supported if the door's pivot has correctly been defined in the modeling software. @alexanderameye do not ask people to place a value on your asset. Only you can do that - the market, us, will determine if it's worth the value you placed upon it. I cannot give you any meaningful feedback, comments, critiques, ideas, or thoughts... no one can. This is merely text and images. If you want feedback regarding anything dealing with digital games or software, you must have testers to give you such data. You know... the entire concept of playtesting. Only you can determine if this has potential. So ask yourself these questions: Is there a need? Am I providing something currently not available? How seamlessly can it integrate into one's project? Is it friendly towards non-technical developers and open enough for experienced developers to modify based on their needs (source control)? Etc. While I don't agree with everything you are saying, you do make some fair points. It's a good idea indeed to get out a beta and get feedback that way. I do not agree that only can determine if this has potential though. I'll take your comment in mind, edit some parts of the post and get out a beta because I do need feedback. The asset is nearing completion. In terms of core features, everything is finished. Because of a lack of beta testers right now, I think I'm just going to release the tool when it's done and see what happens. I'm now cleaning up the code and polishing some features. If you are interested in beta testing, let me know at alexanderameye@gmail.com, I could always use the extra help. The tool will launch at a price of $10. update: The beta testing of V1.0.0 has ended now. If you are interested in testing the new versions of the asset, send me an email with your invoice number and I'll send you the latest available beta version. It is important that Alex's Door System works with as many doors as possible. The system supports several types of doors that are different in scale and pivot position. You can easily select what type of door you have in the settings and the tool will adjust itself to your type of door! I will add more types to this list when I've checked them out. Note that doors pro will probably work with every type of door model you encounter, as long as the modeler has done a half-decent job. tip: If you use doors that have there pivot point positioned where the hinge of the door should be, they will always work correctly. A lot of people have been voting on the 0-5$ price which is a bit demotivating. I'm going to consider putting it at 10$ instead of 15$ but I really do think the asset worth that price. Door scripts on the asset store that have far less features and customizability than mine are being sold for 10$ on the UAS so I think 10$-15$ is more than fair. fnndo, lukkasto and theANMATOR2b like this. The asset was declined because it lacked a proper demo-scene, which is totally fair. Too busy right now to re-submit again, but I will submit a new version within a few weeks that is more user-friendly. My apologies for the delay. update: Looking further into it, there are still a lot of features that I want to polish before the initial release. The initial submission was kind of rushed and it's a good thing that it was declined. It is better to have a solid release than to risk having people encounter nasty bugs and rack up bad reviews. This is very nice! Never put down a price that you don't feel comfortable with. Most folks will always choose the cheapest. Choose what will give you back your time and enough to handle support. I will vote $20-25 and it appears to be well worth that price. That's very kind of you! Someone told me it's easier to sell a 100 assets priced at 1$ than one 100$ asset, but of course it's all about finding that sweet spot! I think I'm going to stick to the plan of starting out fairly low, and then slowly increasing the price with each update. Someone told me it's sometimes easier to sell a hundred 1$ assets than one 100$ asset, but of course it's all about finding that sweet spot! That may be true. But 100 users who paid $1 would be demanding support from you. While with the $100, you would have more advanced users who will ask for support, but more than likely be able to figure out some things by themselves. That's a very valid point! With my free asset I feel like a lot of the times, I'm helping customers out with issues that are not even related to my Asset, but issues they are encountering because they are still learning the basics of Unity. Which I don't mind of course. Thanks for the input, that's actually really helpful! fnndo and Teila like this. Looks very interesting. Will it be possible to use Doors Pro with moving objects (for example for doors and hatches on boats)? I have problems with that with your free version. I didn't think about that yet! Currently the hinge algorithm calculates the correct position of the hinge once, based on the initial position of the door model, and if the door model's position changes during the game, the hinge will be positioned incorrectly! Using the hinge algorithm in this case is a no go. However, the system does support 3rd party doors, and if the pivot point of the door is positioned where the hinge of the door should be, the rotation will be as expected, even if the door is a moving object. For example a door like this with the pivot point already positioned on the rotation axis of the door by the modeler, will work in your situation! Sounds good Alex, the pivot is already set in 3ds max. Looking forward to test it with Doors Pro. I have made a lot of improvements to the asset and fixed tons of bugs. I will be submitting the asset this weekend. Sounds great, can't wait to get it! Alex's Door System V1.0.0 has been submitted to the asset store! I've already submitted it once before so the approval time should be live fairly short. filibis and Bartolomeus755 like this. Great news, looking forward to get the pro version! I am proud to let you know that Alex's Door System is available on the Asset Store right now for $10. Make sure to read the quick-start guide before doing anything else, and if you encounter issues, send me an e-mail. Other than the quick-start guide there can be found an extended documentation file. Teila, filibis, fnndo and 2 others like this. That's great, congrats to the release. ++ for Playmaker Actìons and Support. How about a key 'code' for keys, a password system and even (bear with me) a riddle and answer system? Also, get / set door status methods (ie. Open, opening, closed, closing, locked, jammed, unlocked and closed, unlocked and open, broken and closed, broken and closed etc.)? Reflected in Playmaker actions too of course! I have never used Playmaker so I'll still have to figure that out but support for it is definitely on my todo list! Those get/set systems are interesting. Do you mean that you could call a function like 'Open' from somewhere, and the door will perform its opening rotation, or a function 'Lock' with some parameters that locks the door? That might be very useful! For the alternate 'key' systems, there are already assets that handle these things really well, so rather than re-inventing the wheel, there will be added support for certain keypad/padlock/... assets. Hello guys, and welcome to the first update on V1.1! For every significant new feature in V1.1, I will make a post that I will then update when new things get improved or added to it. The first new addition to V1.1 that I'll be talking about: rotation curves. These curves will let you alter how smoothly the rotation of the door is. This feature will enable people who don't know how to animate to have custom, fluid movements just like if they would be animated by hand! You can pick between presets like linear/smoothstep/lerp/... You just need to make sure your animation curve starts in (0,0) and ends in (1,1) and you're good to go! Also, make sure that the slope of the curve is always positive, otherwise the door will rotate in the opposite direction. Right now, doors pro comes with a default lerp function. This is a smooth function that looks great by default, but maybe you want even smoother rotations! Or maybe you are creating a horror game where the doors closes very abruptly, and in those cases, a regular lerp won't do. If you'd like to know more about lerping, this is a great article on the topic! You'll find a new animation curve field in each rotation block of the rotation timeline. When you click on the curve, an editor window will appear where you can edit the curve. You can add more key-frames or choose from some presets. The speed variable now also has a different meaning than before. The variable basically represents how long the rotation will take. The speed variable determines how long it takes for the door to open. update 1: The animation curve window now has a set grid size to prevent the user from entering negative speeds. update 2: The animation curve now does not influence the speed, but rather the rotation of the door. The separate speed variable has been re-added. The animation curve editor window has been resized. All bugs have been fixed. next up: Pad lock and Key Pad support! Doors Pro supports vehicle doors! Just make sure the pivot of the door is correctly positioned and you're good to go. On another note, I found some bugs that occur when you use Doors Pro on doors that are a bit buried in the hierarchy and have a lot of parents and children. Will be fixed in V1.1.0. Looks useful. I voted $5-10 as it could be handy in some situations, although many people would probably just code this kind of thing themselves rather than pay for it. I'm not saying it's simple to make a nice flexible solution like yours, but people would code their doors for their specific game which would be a bit less work. Still it would be a great tool for developers to buy and use in multiple games easily without having to recode doors every time. Hey, that's a totally fair point! It's definitely something I've thought about, and I'm constantly trying to make this tool easier to use and more feature-full so it's still worth it for even experienced developers. If I can save them even an hour, I think that's worth $5-10! I think the main selling point right now is that Doors Pro is extremely flexible. Users can easily change the whole behaviour of the door without touching any code. More experience developers could of course choose to create the doors themselves, specific for their needs, but using my system, when they want to change the behaviour, it takes a lot less time! I want the whole experience to be as close as possible to just clicking-and-dragging a script onto your door, tweaking some settings to your liking, and you're good to go! I have made a lot of important progress this evening. The new speed system is now completely done (see post). I also completely re-wrote the door rotation code itself. It is now much more stable and the rotation of the door can be controlled more accurately. I just look at the whole forum thread because I wasn't sure of what this asset is made of. I'm very please and impress to where it is going. From the asset store page, it's hard to tell. No video, no rating and strange picture of colored box that don't mean a lot. I would consider a real marketing job over there to better inform us. It will greatly help you as many reader may not reach the forum and just pass. I think a video showing the feature is a must. I think you are building something really usefull and great and I think that in it's final form with all the feature you are talking about, we are lucky to get it for 20-25$. I was about to code a very basic open and close door but i went on the store to save time. Glad to found this. I would like to see if it's possible to slowly open a door. Like to peek inside without opening it. I remember game like RB6 and Swat (yah, the old days) we were able to open using the mouse wheel and we were able to open the door a few degree at a time. I'm also wondering, (and that is not asset related, but really questioning my self on how to do that), if it is possible to have a third party game and have the door open when a player state is done (like having an animation of the character actually reaching out for the door and opening it). Have an animation to reach out the keypad, or magnetic card reader... stuff like that. EDIT: ill definitly buy it and leave you a good review on the store. Thank you for the feedback! Right now I am definitely under-marketing the asset on purpose. I really want to add in sound and animation support first before I start marketing the asset. Right now the asset has the rotation timeline and rotations controlled by animation curves, but it doesn't support sound clips, which is pretty unbalanced. I want the system to have a nice, balanced set of features and hopefully this will be achieved after V1.1.0 has been released. With the release of V1.1.0, there will be a new documentation, a new asset store page, tutorial videos and a new forum page. That 'peek' feature is so damn cool! I've added it to the wish list. I've you'd like to add more feature requests, you can too on my Trello Board! Right now you definitely open up a door very slowly in a peek-kind of way. You could use the rotation timeline for this. Just add in two single rotation blocks. One that opens the door from 0 to 15 degrees, and another one that opens the door from 15 to 90 degrees. Set the speed on the first rotation block to be very slow so it's more like you are 'peeking', and then a regular speed on the second rotation block. 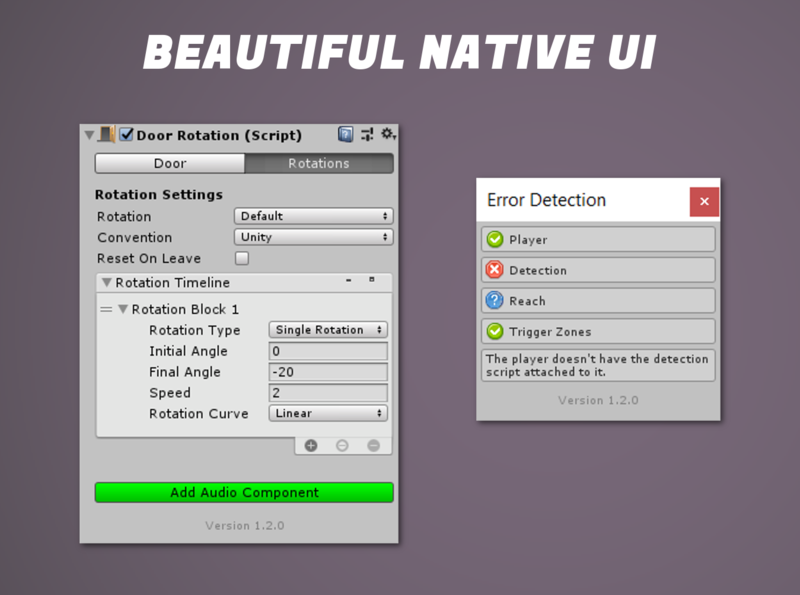 With the animation curves in V1.1.0, you'll be able to fine-tune how the door actually rotates. For the character animation: it is definitely possible to do this with animations. Maybe you could do this with FinalIK? I'm pretty inexperienced when it comes to the animation part of Unity so can't really help you there. If you have purchased the asset and you'd like to have a beta version of V1.1.0, you can always contact me through mail! I have some bug free (as far as I know at least) versions. 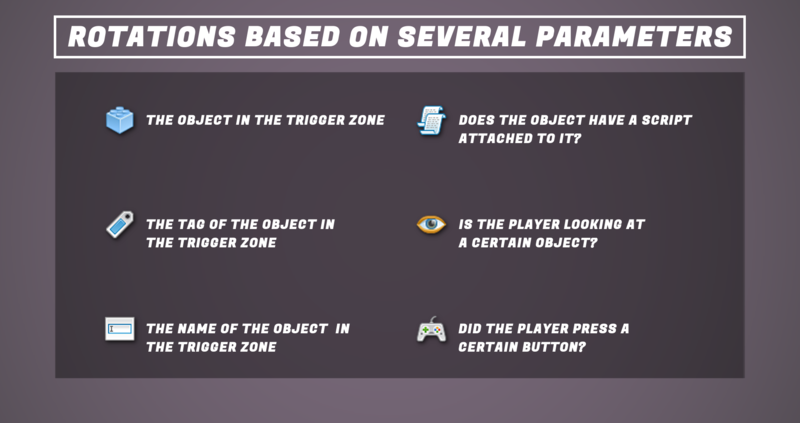 In this update we'll take a look at the new type of trigger zones you can use. In the Trigger.cs inspector, you'll find a new enum where you can pick between as cubic and a spherical trigger zone. Spherical trigger zones are handy because they allow for a more 'natural' feel. This is a small update, but it's a useful one! Later in development I will also add support for the ProBuilder trigger zone feature. Unplug and Bartolomeus755 like this. Hi everyone, I created an extension for this Asset and I want to see the community interest in getting those feature and also the original developer interest about my work too. So this extension is completely independent, it's an external script that ADD feature that are otherwise not available and the script play with the door pro script on the fly to make the magic work. Not tested with door that have more animation block, it is meant to do exactly what you see in the video, but maybe people will find other creative way to use that. EDIT 2 : The best way to solve the bouncing problem and preserve peak opening on a view trigger is to have a layermask on the raycast to detect only door. To do that, you can modify the original scrip. I'll ask the developer if he want to include a layer mask to avoid hard-coding. Bartolomeus755 and alexanderameye like this. In this update, we'll take a look at sound. Sound support will exist under the form of a separate sound component. You can add this sound component by simply clicking on a button in the rotation component that is attached to your door. This will add a sound component to your door where you can add sound clips that will be played when the door opens, closes or is locked. You can set the volume and pitch of each clip. There is also a delay variable that offsets the timing a bit so you can delay your audio clips. The locked audio clip will be played whenever a player tried to open the door by pressing a button, but doesn't meet the requirements. This is only the start of this new component, more features will be added in future version of the system (after V1.1.0). update 1: Added 2 more audio clips (opening/closing). next up: Quality of life improvements! Completely unrelated to Doors, but i saw in one of your earlier replies that you didn't know how to link directly to WebGL builds. I recommend creating a free Hostinger account and creating a new domain (you can use one of their free ones, but you get something weird like .esy.es). Then, upload the WebGL build and set the website to redirect to the index.html file. It's really easy once you get the hang of it, and you can change the build anytime you want so it only shows the most up-to-date one. The asset is looking great too, good job. Hi there, your support website and publisher's website links don't work on the asset store. I'm looking for a doors system for my third party doors. I am using RFPS for my character controller. I am looking for two types of doors, a basic rotating open and close door and a sliding from center outward, like automatic glass doors you might run into the mall, they split apart as you walk towards them. I am also looking to be able to have audio effects on them. Will your asset provide this in it's current state? If not, what is the ETA on when it will? I changed my Twitter handle recently so those links are outdated. It's fixed now, thanks for pointing that out! In its current state (V1.0.0), my system will not provide sliding doors and sound support. However, if you have purchased the asset, I can send you a custom beta version of V1.1 that includes audio! Sliding doors will not be included in the near future. They are currently on the backlog with no ETA. I am still thinking about how I will implement those. 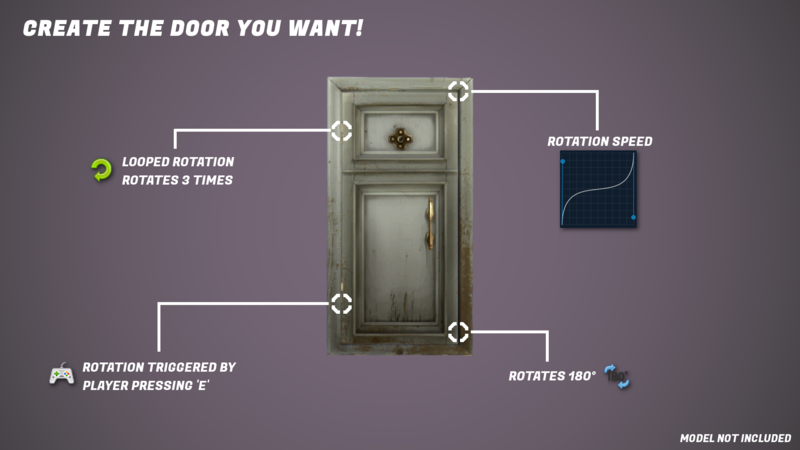 Physical rotations work great for regular doors but once you go more complex (e.g. garage doors), animation is the way to go. I am still deciding whether or not I should implement sliding doors or not. The ETA on when a beta version with working sound would be ready is probably within 2 weeks. This will be beta version V1.1.0b4. With some luck it should be ready this weekend. The sound system works but I want to clean up the GUI a bit and add in the feature to play sound clips with a time offset. update: Beta V1.1.0b4 is now available. Sounds great Alex, looking forward! Past week I have still been doing some work on the tool Since I don't have a big feature to show you right now, I'll talk about all the little stuff I've implemented the past few months that improve the quality of Alex's Door System. Let's get started! The Has Script field in the trigger zone inspector now allows you to click and drag a script onto it instead of having to identify the script by name! All variables now make use of serialized properties. This allows support for prefab-overrides and multi-object-editing. All the trigger scripts (MoveTrigger, OpenTrigger, CloseTrigger) have been merged into 1 script. The Has Tag field in the trigger zone inspector now allows to pick the tag from an enum instead of having to enter the tag as a string. Added support for doors that have initial rotations applied to them. 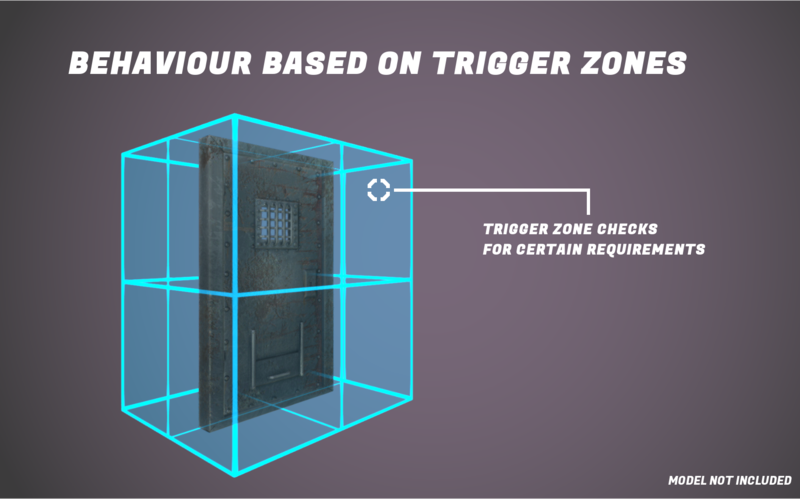 Improved the trigger zone spawning when adding a new door. Added warning and info messages to guide you through the setup. Made the 'Rotations' tab the default tab since you use that one the most. All these updates are relatively small, but these details will enhance your experience with the asset. Last few days I also fixed some bugs and completed a lot of cards that were on my Trello to-do board. Now that these smaller things have been cleared, I can focus on adding the last new features. ps: If you have bought Alex's Door System, send me your invoice number and I'll send you the latest beta version of V1.1.0! next up: Reset on Leave! It's me again with the last update for this week (I won't post anything this weekend). In terms of features I've been working on some automatic close system when a player leaves a trigger zone. When I was writing the actual code, I hit some roadblocks that required a re-write of a whole bunch of code in order to solve them. Also, I didn't see where I was going with this automatic closing system since I can't quite find scenarios where you would actually need them. Every scenario I made up in my head, you could solve with the existing systems, automatic closing just would make it easier. That's why for now, I have put that feature on hold until I have made a clear idea in my head of what I want the feature to be and why it will be useful for users. I'm going to start with re-writing some parts of the code, and maybe then it'll become clearer to me what to actually do with this feature. If anyone has some ideas about how a 'close on leave' or 'reset on leave' feature should look, let me know. Here is the feature in action! Another thing I did was rewrite the whole rotation coroutine code. It's more stable now, less cluttered and easier to read. The new speed system also offered a lot of improvements to the rotation code. Whereas before I was using some 'hacky' code to solve some issues, it now is angle-perfect. I'm extremely happy with how it currently performs. I also created a new class that allows you to call your own rotations! at the top of your script and call the following coroutine. The rotation uses a default 'EaseInOut' curve but you can change this to a custom curve if you want to. update 1: Simplified the 'Reset On Leave' code a lot. next up: Rotation based doors! Thanks Marko! I'm very happy with the progress so far.